Autopsy Part III: Was Jealous Just Too Left Wing? Jealous was among the most left-wing candidates running for governor this year. While Jealous took offense at being asked if he is a socialist, it’s hardly an out-of-the-box question for someone who was a co-chair of Bernie Sanders’s presidential campaign. Sanders has been a proud socialist for decades. Moreover, Jealous ran as the most left-wing candidate in primary, consistently outbidding his opponents as the most uncompromising progressive. The Jealous campaign promised that his hardline positions would motivate minority and progressive Democrats to vote and to elect him over Larry Hogan. Obviously, it didn’t work out that way. But did Jealous’s left-wing positions matter? Why Did Jealous Perform Markedly Worse Than Abrams and Gillum? Jealous performed far worse than strong progressives like Stacey Abrams in Georgia and Andrew Gillum in Florida who faced much more hostile political environments. Why? For starters, Adams and Gillum ran not just as progressives but as pragmatists who wanted to make a real difference instead of hardline ideologues. While Jealous promised single-payer healthcare and attacked the Affordable Care Act for its high premiums in comments eerily similar to those of Republicans, Abrams and Gillum wanted to take advantage of the ACA’s Medicare expansion to cover more people in their states. Abrams and Gillum’s experience and accomplishments in government gave them fluency on the issues and heft to their plans to make government work better for ordinary people. Jealous’s pie-in-the-sky plan to pay for single-payer health care by legalizing marijuana and reducing the prison population lacked similar credibility. Centrist Democrats had the luxury of a real choice. While they would have voted for Jealous against a right-wing kook, they voted in large numbers for Hogan against a left-wing Democrat. Georgia and Florida Democrats didn’t face the same choice and voted for less dogmatic Abrams and Gillum, who also ran better campaigns, in huge numbers against Trump Republicans. It turns out that perhaps centrists need even more attention than progressives, as centrists are more likely to have somewhere else to go. While the ultra-progressive strategy works great in primaries, it leaves Democrats extremely vulnerable when the Republicans present less kooky options like Hogan. Hogan has shown once again that minority voters are perfectly willing to consider Republicans when presented with non-racist non-wingnut choices. Ironically, the former NAACP leader appeared to assume that he would automatically gain massive African-American support and that other people of color would also line up behind his banner. Neither happened. Hogan’s acceptability on key racial issues freed up African Americans, who hold diverse beliefs on many issues just like everyone else, to look at other questions. Jealous was not well known in the African-American community and a good chunk of black voters found Hogan’s attempts to keep taxes stable and reduce burdensome fees more appealing than Jealous’s promise of radical expansion of Maryland government. Jealous’s hardline left-wing campaign was ill-equipped to take advantage of the major winds benefitting Democrats among well-educated white women. While not the only group to shift Democratic this year, they moved blue most sharply and they make up a disproportionate share of voters in well-educated Maryland compared to other states. Usually middle or upper-middle class, many of these voters are moderate or even former Republicans put off by Trump’s constant violation of norms and extremism on social and environmental questions. Though repelled by Trumpian radicalism, they are unsurprisingly also chary of more radical and less pragmatic Democratic plans. Hogan’s preemption on many issues, such as health care and community college, made Jealous’s plans an even tougher sell. This didn’t cost Jealous the election but did help pad Hogan’s margin. This explanation is a bunch of hooey but serves as a convenient excuse for disappointed Jealous supporters looking to blame anyone except the candidate. Large numbers of current Democratic officials hold the same positions as Jealous or are certainly willing to consider them. As I’ve detailed previously, the party was fully behind Jealous. Remember also that the full weight of the establishment didn’t manage to elect Anthony Brown four years ago. To the extent that some elected officials didn’t hug Jealous tightly, it was for far more practical reasons. Most thought was a lousy candidate and seemed certain to lose. Why on earth would Democratic candidates for the legislature tie themselves to a sinking ship, especially if they aspire to represent areas where Hogan was about to win big? Notwithstanding Jealous’s claims to be at the center of progressive accomplishments in Maryland, legislators didn’t know him and Jealous evinced little desire to know them, as his skipping the MACO meeting in Ocean City made plain. Jealous also didn’t endear himself to members of the General Assembly by bashing their progressive credentials in the primary and then taking credit for progressive legislation in the general. At the end of the day, however, these problems had little to do with Jealous’s loss. Indeed, Jealous’s loss had far more to do with candidate choices, his lack of money, and the failure to get out any message that could rally Democrats in the general election. Autopsy Part II: Why Did Jealous Lose? Continuing my analysis of why Jealous did so poorly in the gubernatorial election, today’s post examines factors that contributed to Ben Jealous’s defeat. This is really the key factor. Gov. Larry Hogan was a good candidate. Throughout his tenure, he’s had an eye for the small politically popular act. He didn’t make any major changes, which also meant that few were offended. His cancer made him all the more sympathetic. Democrats thought that reaction to Trump would bring him down but Hogan proved a nice contrast. On top of that, the Governor raised a ton of money for his reelection campaign. Notwithstanding the lie on his campaign website that he “lived in Maryland throughout his career,” Ben Jealous’s ties as an adult to Maryland are quite weak. He only began voting here in 2012 and the 2018 gubernatorial primary was his first. Even when Jealous headed the NAACP he lived in Washington, D.C. Especially outside of the D.C. suburbs, Jealous came across as a member of the Washington establishment rather than a Marylander. Marylander has a history of rejecting candidates viewed as having parachuted into the state. Ironically, the repeated reference to Jealous as the “nationally known” leader of the NAACP only reinforced this impression. Moreover, Jealous is well-known in elite Washington circles but not so much among ordinary African-American Marylanders who ended up voting for Hogan at far higher rates than usual for Republican candidates. During the primary, Jealous didn’t tout a single endorsement from any local or state officials of any race. His campaign repeatedly brought in national politicians. Jealous’s knowledge about Maryland was painfully thin at times. He made ending mass incarceration a central plank of his campaign. Except the General Assembly working with Gov. Hogan had already taken action on this issue. As David Moon mentioned in a recent blog post, Maryland now has the fastest rate of decline in its prison population. Jealous massively over claimed about his political impact in Maryland. He touted frequently his leadership in fights to eliminate the death penalty and pass marriage equality. I spoke with Sen. Bobby Zirkin, one of the pivotal senators on the death penalty question, and he still has never met Jealous. Similarly, none of the General Assembly leaders on marriage equality met or strategized with him during the lengthy battle on this issue. The campaign repeatedly relied almost exclusively on an increasingly shopworn citation from the Baltimore Sun as “Marylander of the Year” to buttress his claims. But neither Jealous nor his campaign backed up these claims convincingly or had Marylanders ready to attest to them. Finally, even his record as leader of the Baltimore-based NAACP was mixed. Jealous liked to talk about all the money he brought in to the NAACP and his role in building up the organization. But he left it facing a financial crisis. Revenue was down by roughly one quarter in his last year and the organization is now about the same size as when arrived but poorer, as the NAACP’s assets declined substantially during his tenure. The love of money may be the root of all evil but campaigns need it to get their message out. In Montgomery County, the campaign almost did not exist until the very end when we were treated belatedly to a bushel of low-quality television ads. I never saw any online ads for Jealous. Nor did I receive any mail from the campaign. I don’t know why Jealous didn’t have the money. During the primary, Jealous used his vaunted ability as a fundraiser to convince many endorsers to support his campaign. He delivered in the primary, but the general was a bust notwithstanding his claims that he could raise in excess of $10 million. Despite being labelled inspirational and transformative by supporters, the Jealous campaign’s fundraising contrasted dramatically with even average Democratic candidates around the country who outraised their Republican opponents. Did he just not engage enough in the necessary evil of call time? Part III continues this analysis of this year’s Democratic gubernatorial defeat. After a losing campaign, people are often looking for someone to blame. Racism and a lack of party support are two reasons that some of Ben Jealous’s more zealous supporters think explain his loss. Today, I take the bull by the horns and argue that neither can explain why Ben Jealous lost the governor’s race so badly. Democrats are often quick to turn to isms when their preferred candidate loses or someone is supporting someone else. But identity is a poor explainer here. It doesn’t explain why Jealous is down 4.4% from Anthony Brown’s vote share in 2014. Remember also that Brown ran in a year far more hostile to Democrats that resulted in a lower share of Democratic voters at the polls. In the primary, over 80% of Democratic voters cast ballots for nonwhite candidates. Equally important, much of Hogan’s strongest gains appear to be among minority voters who Jealous thought would propel him to victory. Hogan’s vote share was up 10% in Baltimore City and 13% in Prince George’s County. The same electorate in Howard that rejected Hogan elected Calvin Ball as county executive over a white incumbent. In Montgomery, Hogan’s share of the vote jumped 8% to nearly 45%. These are the same voters who elected Ike Leggett to three terms as county executive and just elected Will Jawando to an at-large seat on the county council. Race and party are intertwined with views on racial issues playing a significant role in shaping party identification. But partisans seem increasingly willing to vote for their party’s candidates regardless of race. In Florida, Andrew Gillum lost by just a little more than Bill Nelson. Even if the difference is due to racism, it’s not a huge one. President Donald Trump certainly did a lot to motivate Democratic voters. The Maryland Democratic Party at the state and local level worked hard to promote Democratic turnout and, by all accounts, worked closely with the Jealous campaign. There was no hostility or effort to throw him under the bus. Don’t forget that Susie Turnbull formerly chaired the MDP. Based on the results, they did a great job in taking advantage of a favorable political environment. Not a single Democratic delegate lost, and the party managed to take seven new seats. Democrats lost two Senate seats narrowly in very hostile turf but managed to pick up another. Democratic candidates scored upsets in the Anne Arundel and Howard county executive races. In short, the party delivered. Jealous was simply unable to take advantage of it for a variety of reasons, some of which were simply beyond his control and for which no one is to blame. I plan to discuss these problems in Part II. How Will Turnout Matter This Election Cycle? I’ve been covering who has been turning out in early voting heavily the past few days. There is little evidence of a wave of young voters turning out that will carry the Democrats to victory. At the same time, the electorate looks much improved for Democrats from 2014 even if it is not showing signs of being as favorable to them as the 2016 presidential electorate. Of course, we won’t know the complete picture about how turnout has changed from either 2014 or 2016 until all the votes have been cast. 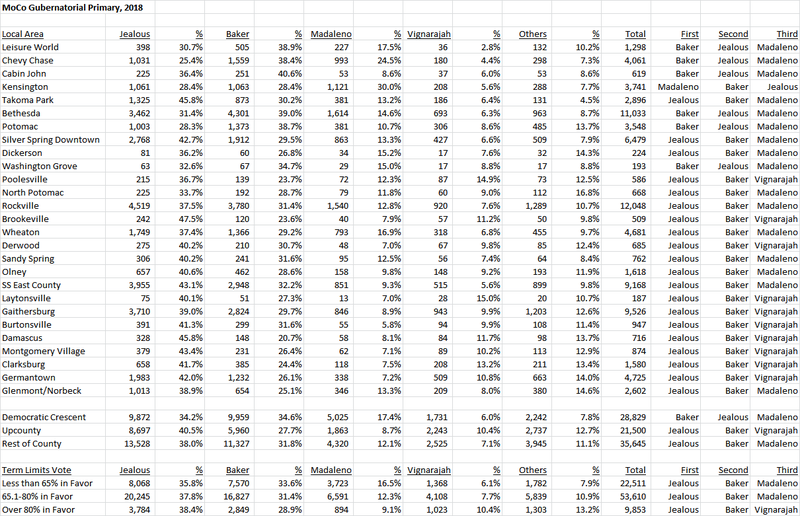 But it seems important to take a moment to pause from statistics to consider when and how turnout dynamics matter. Based on the polls, Ben Jealous is in dire trouble. In a future post, I hope to explore why Jealous is flailing despite Maryland’s favorable demographics that should be even more favorable due to shifts in voting behavior unleashed by Trump in a future post. In a nutshell, he losing far too much of the Democratic base. Anthony Brown fared poorly among white voters four years ago. Ben Jealous looks set to do even worse even as Democrats elsewhere look poised to make substantial gains among highly educated women. Equally problematic, he is hemorrhaging support among nonwhite voters. Even the most favorable Democratic turnout wind cannot save Jealous from these fundamental problems. They could help close the gap with Hogan but that would merely serve to make his loss somewhat more respectable. But there is no way that Jealous can win the election if he loses roughly 30% of Democratic voters as polls currently indicate. Except to my surprise in our polarized era, voters seem quite inclined to split their tickets. The same polls that show Larry Hogan receiving a vote share in the high 50s reveal similar proportions wanting Democrats to control the legislature. In 2014, the Republicans picked up the low hanging fruit in several districts that had long leaned more Republican in national elections and became even more so with Trumpian populism. But there were simply enormous gaps in support for Hogan and Republican legislative candidates elsewhere. That pattern could easily appear again in 2018. Gov. Hogan has framed this election as a vote to maintain what he presents as our much improved status quo and that he works well with the legislature. That’s hardly an argument to throw out Democrats in the General Assembly. Republicans are hoping that better candidates and huge financial investments will change this dynamic. But Democrats who defect for Hogan may not be so quick to do so when presented with different candidates. Democrats who think Hogan is fine or Jealous has too many unrealistically expensive plans will often find their local Democratic candidate better attuned to their patch and deem the Republican too right wing. In Senate races with Democratic incumbents fighting a tough battle for reelection, such as Ron Young in Frederick or Kathy Klausmeier in Baltimore County, a more favorable electorate could provide them with a crucial cushion. It could also make a difference in the many exciting county executive races and help, for example, carry Johnny Oleszewski into office in Baltimore County. The races in Howard and Anne Arundel have also tightened, though it’s unclear how much. If Democratic challengers can get within a few points, a more favorable electorate could open the door to an upset. It won’t be enough to overcome a spread that looks more like 55-45. In short, this year, turnout dynamics look likely to have the potential to play a crucial difference around the margins but the candidates have to get close enough for the margin to make a difference. All campaigns understandably like to describe themselves as people powered but money remains the mother’s milk of politics. The campaign with the most money doesn’t always win but more money doesn’t hurt. Even if they can’t raise more than their opponent, campaigns need enough of the green to get their message out. The 2018 gubernatorial race has been no exception. In the Democratic primary, Jealous used his national connections to handily out raise his opponents. Moreover, organizations pay attention to fundraising and Jealous leveraged his prowess to gain further support. Jealous benefited additionally from outside expenditures in excess of $1 million that paid for a burst of television ads in Baltimore as the campaign drew to a close. Put in context, this amount exceeded the total raised by any single candidate according to the final pre-primary campaign finance report. In an uncomfortable symmetry, Jealous now finds himself in the position of his primary opponents. During the primary, Jealous boasted that he could raise in excess of $10 million for the general election. But Jealous raised $1.1 million in the two months following the primary. Hogan took in $2.5 million over the same short period, leaving him a total of $9.4 million to spend at in the final months of the campaign. Compounding Jealous’s problems, the Republican Governors Association has spent $1.4 million to boost Hogan. Unlike in the primary, no outside groups seem willing to aid Jealous. As a result, Hogan has been able to pound home the message the Jealous is a far-left candidate and tout himself as a moderate fellow who survived cancer and turned around Maryland. Jealous’s lack of funds has left Hogan’s attacks unanswered. Leaving aside Hogan’s barrage, I could almost swear I live in Virginia. I now know that Barbara Trumpstock votes more with Big Orange than any other Virginia representative. Genial Tim Kaine has joined her as a regular presence on the box. I even saw a stray ad for Ben Cardin. Nothing from Ben Jealous. If the Jealous campaign is spending money to communicate by other means in my neck of the woods, they’re hiding it well. Nothing from the welter of progressive organizations backing him either. Ads for Marc Elrich have started appearing in my web searches. Nothing from Jealous. No email. No snail mail. No phone calls. No texts. No door knocking. No carrier pigeons. Nothing. Heck, I can’t recall having laid eyes on a single yard sign for Jealous. Despite his vaunted fundraising and community organizing skills at the NAACP, the campaign has not raised enough to be competitive in a statewide race against a strong opponent. Voters are learning little about the candidate or his message from the campaign. Larry Hogan has been happy to fill in the blanks. In 1984, citizens of Oceania use doublethink to erase events from history. That effort probably isn’t even required for the recent gubernatorial debate. If a debate occurs on MPT amid a cacophony of Trump tweets and receives only brief press coverage, did it occur? The debate struck me as a draw at the time, and Jealous needed more than a draw even if the audience exceeded political junkies. After marinating longer on the outcome, however, I’ve come to think that Hogan did more than just get through the 55 minutes unscathed but ultimately won. Both candidates were ridiculously over the top in discussing the State’s economy. According to Hogan, Maryland was experiencing an economic apocalypse until he came along and now it’s Morning in Maryland. In contrast, Jealous presented Maryland as impoverished and facing rack and ruin thanks to Hogan. Neither remotely resembles the state I know. Fact checking by the reporters would have been most welcome. Hogan and Jealous both came across as smart and knowledgeable. However, Hogan had a penchant for rudely interrupting Jealous in a manner echoing Donald Trump’s debating style. Jealous was more patient but frequently went into high dudgeon and berated the governor instead of addressing the voters. A key reason Jealous lost is that he failed to turn the debate to questions on which Hogan is on the wrong side of public opinion. The $15 minimum wage enjoys broad public support and it’s a cornerstone of Jealous’s positioning as a tribune for the forgotten. Never came up in the lengthy debates about the economy and living standards. Another problem Jealous faced is that the tactics used to effect in the primary—getting outraged and outbidding his opponents—fell utterly flat. When Hogan brought up Jealous’s recent residency, Jealous went into high dudgeon about how laws banning interracial marriage prevented his parents from living in Maryland. Hogan utterly destroyed Jealous in his reply, After first eloquently acknowledging the struggle faced by Jealous’s parents, Hogan then pointed out that facts nonetheless are facts. Jealous lived in California and then DC until recently and never voted in a gubernatorial primary until he voted for himself. Hogan didn’t even have to bring up his own interracial marriage. Jealous repeatedly tried the tactic of saying that he would have acted faster and done more on any given issue as he lambasted Hogan’s response as inadequate. Jealous, for example, repeatedly derided Hogan for taking so long to declare an opioid emergency. Yet Hogan’s response that he had charged the Lieutenant Governor with coming up with a good approach that had now been adopted and made Maryland a role model sounded perfectly reasonable. Jealous’s combination of outrage and outbidding fell flat. Jealous faced the same problem on issue after issue, as Hogan could point to sensible bills passed by the General Assembly already accomplishing these goals. Community college? Already done and trying to outbid and do more sounds expensive and requiring more taxation. Teacher pay? Hogan loves to point out we’re spending more than ever on education (notwithstanding the cuts he made) and Jealous’s proposed 29% increase in teacher pay sure leaves voters wondering who is going to pay for it when their own salaries are not rising anywhere near that fast. Wanting to release more prisoners seems oblivious to the General Assembly’s recent passage of law to accomplish that goal and feeds into Hogan’s (specious) claim that Jealous wants to unleash violent criminals on the street. Unfortunately, Jealous also fell victim to the Democratic obsession over plans, at one point pointing out vehemently that he has a plan and Hogan didn’t. Except that voters can judge Hogan by his record, and voters care more about hearing about the general direction and clear ideas. In any case, the plans on Jealous’s website are often less specific than advertised. The coup de grace occurred when Jealous trotted out yet again that the Baltimore Sun named him Marylander of the Year. Though there is no love lost between Hogan and the Sun, he positively enjoyed pointing out to Jealous that this was something they had in common, as he too was a past Marylander of the Year. In short, Jealous failed to shift the debate to advantageous ground. His outbidding strategy just fed Hogan’s claim that Jealous is too extreme on policy and will raise your taxes while allowing Hogan to sound like a sensible centrist. In politics, it’s an iron law that unions always endorse Democrats, yeah? Labor is known for supplying money and manpower to the Democratic Party in an alliance dating back decades. But the truth is more complicated owing to the complexities within the labor movement little appreciated by outsiders. And that truth just erupted in the Governor’s race in a big way. Recently, the Laborers International Union of North America (LIUNA), one of the largest unions in the country, endorsed Republican Governor Larry Hogan. 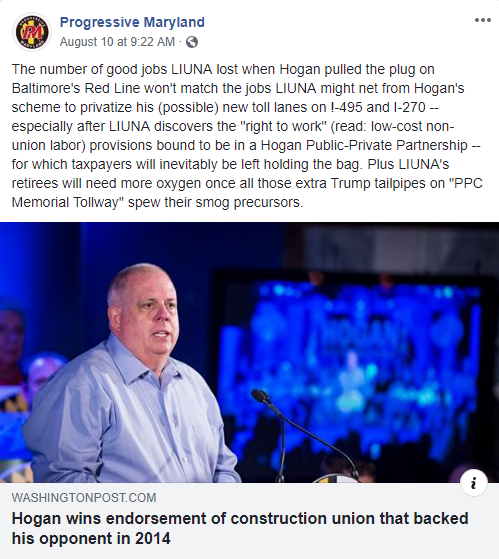 As the Washington Post noted, LIUNA had supported Hogan’s 2014 opponent, then-Lieutenant Governor Anthony Brown, and gave him a last-minute $500,000 loan. Why is this such a big deal? First, LIUNA is in part a building trades union. A big chunk of its half a million members work in the construction industry alongside unions representing carpenters, electricians, operating engineers, iron workers, bricklayers and more. Accordingly, it has an interest in landing construction projects for its members. The Post reported, “A spokesman for the union said it is backing Hogan because of his emphasis on building roads and bridges – particularly his $9 billion proposal to add toll plans to Maryland’s most congested highways.” LIUNA Mid-Atlantic Vice President Dennis Martire added, “Transportation infrastructure continues to take a back seat for many elected officials… It’s refreshing to see Governor Hogan’s proposed plans for Maryland’s roads and highways.” Local organizations affiliated with two other building trades unions – the Roofers and the Plumbers and Pipefitters – have also endorsed Hogan. Don’t be surprised if more trades climb on board. Second, LIUNA is one of the most diverse unions in the country. It represents large numbers of African Americans and Latinos who are not as socially conservative as the other trades and public safety unions that are supporting Hogan. Many LIUNA members are government employees, and in Montgomery County, the union represents trash haulers who are employed by county contractors. The union’s legislative agenda goes beyond traditional building trades issues. In endorsing Rich Madaleno in the Democratic gubernatorial primary, the union cited his work on earned sick leave and the $15 minimum wage. LIUNA also endorsed Marc Elrich for County Executive. That’s right, folks – here is an organization that supported Madaleno, Elrich, Brown AND Hogan. Third, LIUNA spends massive amounts on Maryland political campaigns. From 2005 through June 2018, the union contributed $2.2 million to Maryland candidates, PACs and independent expenditure committees. Its biggest expenditures were $678,065 to the Clean Slate Baltimore PAC opposing 2016 Mayor candidate (and former Mayor) Sheila Dixon; $528,500 to Anthony Brown’s 2014 campaign for Governor; $150,000 to the One State One Future Super PAC for Brown; $78,250 to the state Democratic Party; and $35,000 to the Progressive Maryland PAC that ran negative TV ads against County Executive candidate David Blair. There is no indication that the union will spend any money promoting Hogan, who – Lord knows! – doesn’t need more money. But LIUNA’s resources are now off the table for Democratic nominee Ben Jealous, who could have used them. Speaking of Progressive Maryland, LIUNA is one of their dues-paying affiliates. That didn’t stop Progressive Maryland from criticizing LIUNA’s endorsement of Hogan on Facebook, an almost unheard-of act by an umbrella group against a member. That’s how much LIUNA’s choice stings the left. Finally, consider this. One of the most remarkable findings in the recent Gonzales poll showing a sixteen-point lead for Hogan over Jealous was its estimates for Baltimore City and Prince George’s County. Those are two jurisdictions Jealous needs to win by big margins, but the poll shows him leading Hogan by six points in the City and thirteen points in Prince George’s. We are skeptical that those margins will hold. But to the extent that middle-class African Americans are a key to the election, it’s hard to think of many labor unions that represent more middle-class African Americans than LIUNA. There’s a long way to go to Election Day and Jealous still has some large and powerful groups behind him. But none of this is good for the Democrats. Hogan must be smiling all the way to the hiring hall and beyond. Disclosure: The author worked for LIUNA in 1994 and 1995 and spent sixteen years working for building trades unions. Ben Jealous is the latest in a long line of national political figures with little to no experience running for office who try to parachute into Maryland politics and find the landing rocky. Republicans often tried this strategy in the past due to the dearth of local talent. Barbara Mikulski easily dispatched Linda Chavez to win her Senate seat in 1986. Paul Sarbanes defeated Alan Keyes with little trouble in 1988 and Mikulski trounced him in 1992. More recently, Democrat Kathleen Kennedy Townsend lost to Bob Ehrlich. While Townsend had developed Maryland roots, her strong links to the Kennedys undermined perception of her as a local. Moreover, her only successful previous run for office was as lieutenant governor on Parris Glendenning’s ticket. Though many Marylanders hail from elsewhere, especially in the DC area, Maryland identity remains strong. Candidates perceived as having stronger national than local ties don’t do well. Unfortunately, it’s a four Pinocchio. Jealous only began voting here in 2012. He was touted as a candidate for mayor of Oakland (California not Maryland) in 2008, and voted in California in 2006 and 2008. Even when Jealous headed the Baltimore-based NAACP, he lived in DC, where he voted from 2000 to 2004, and in 2010 to 2011. His running mate, Susie Turnbull, has been active in Maryland much longer, including as head of the Maryland Democratic Party. Like Jealous, she has not run previously for local office. Instead, she was Vice Chair of the DNC and worked for Members of Congress. It didn’t help when Jealous began his campaign by talking about removing Larry Hogan from “the White House” and Turnbull spoke about when she moved to “Washington” and meant Maryland. Jealous’s primary campaign had far more backing from national than local Democratic officials. He touted endorsements from Sens. Bernie Sanders, Corey Booker and Kamala Harris, LA Mayor Eric Garcetti, and New York Mayor Bill DeBlasio. Meanwhile, he did not tout a single endorsement by a local official during the primary on the endorsement page on his web site. Jealous’s primary campaign benefited heavily from an independent expenditure campaign by one-percenter Californians. As the Democratic nominee, Jealous now has the backing of most elected Democrats, though many expect him to lose and are not heavily invested in his campaign. Jealous’s tendency during the primary campaign to make Sanders-like attacks on the Annapolis Democratic establishment yet simultaneously take credit for so much of their work, understandably grated and hasn’t been forgotten. Comptroller Peter Franchot and Montgomery County Executive Ike Leggett have not endorsed him. Jealous has felt lots of love from the national political establishment and from ultra-progressives. Not so much from Maryland officials or Maryland general elections voters. Former NAACP President Ben Jealous won every county in Maryland in the Democratic primary except Prince George’s and Calvert, where Prince George’s County Executive Rushern Baker outpolled him. 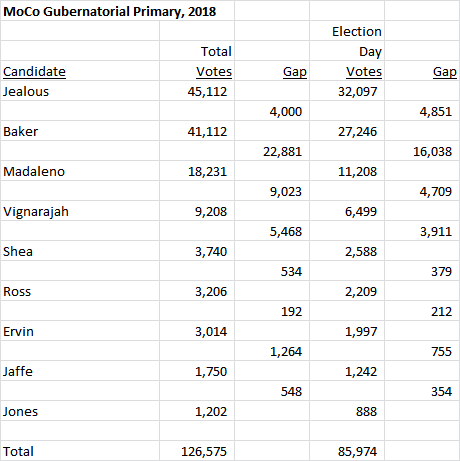 In MoCo, Jealous received 35.6% of the vote and Baker received 32.5%, a difference of 3.1 points. The precinct results we show below only include election day votes, which accounted for 68% of the votes cast for gubernatorial candidates in MoCo. Still, they show the patterns of voting for Jealous and Baker as well as for Senator Rich Madaleno (D-18), who finished third in the county, and former Michelle Obama aide Krish Vignarajah, who finished fourth. Overall, MoCo saw a two-man race between Jealous and Baker. Madaleno was a distant third; he finished first in Kensington but no higher than third anywhere else, including in District 18. Vignarajah was fourth overall but finished third in Council District 2, State Legislative District 39 and several areas mostly located in Upcounty. Generally speaking, Baker did well in white, wealthy areas in the southwest while Jealous won almost everywhere else. The racial differences in voting between Jealous and Baker can be easily seen in the demographic splits. Baker won majority white precincts and the size of his advantage grew as the white percentage rose. Jealous won “majority minority” precincts by 14 points. One more factor to consider is the Washington Post, which endorsed Baker and attacked Jealous. In a forthcoming blog post, we will compare the performance of Council At-Large candidates endorsed by the Post to those who were endorsed by MCEA. The Post candidates’ performance was strongest compared to those supported by MCEA in Chevy Chase, Cabin John, Bethesda and Potomac – many of the same places where Baker performed best and Jealous performed worst. We show the full splits below. While Jealous won MoCo, he lost in the wealthy areas that tend to have disproportionate numbers of campaign contributors. That’s an important fact to note since Jealous is trailing Governor Larry Hogan badly in fundraising from MoCo. Jealous should tap into any MoCo surrogates he has, especially in Chevy Chase, Bethesda, Potomac and Kensington, to help him fortify those areas and raise money from them. If they don’t come around to the Democratic nominee, Jealous’s path to Government House will be that much harder. Next, we will begin looking at the County Executive candidates. Who is Paying for RGA’s Campaign? As we have previously written, the Republican Governors Association (RGA) has launched a TV and mail campaign promoting Governor Larry Hogan and attacking Democratic nominee Ben Jealous. RGA is a 527, not a PAC or a federal political committee regulated by the FEC, and since the Citizens United decision it is free to advocate for and against candidates. However, in Maryland, it is registered as an Independent Expenditure (IE) Committee and must disclose its contributions and expenditures. Below are the 21 entities (17 organizations and 4 individuals) who have contributed to RGA’s Maryland IE account. They have combined to contribute $1,037,500 to the campaign. All but one (Gary Mangum of Bell Nursery) are from out of state. The four healthcare and pharmaceutical companies contributed $300,000, which is interesting considering that Jealous is known for advocating single payer healthcare. Indeed, one of RGA’s TV ads slams Jealous’s healthcare proposal over its alleged cost. The $100,000 contribution by student testing firm Data Recognition Corporation is also noteworthy. Is it seeking contracts in Maryland? One more item from the IE filings stands out: the vendors collecting its money are all based out of state. Are there no consultants based in Maryland who are capable of doing political work? So far, the IE has spent $1,648,663 on TV, online ads, mail and consulting fees. Compare that to the $2.9 million raised by Jealous’s campaign for the entire cycle. RGA’s last IE report was dated July 11. If the campaign continues, there will be more reports. Who knows how much they will spend by the time they are done?